The Senator representing Kaduna Central Senatorial zone has reacted to the threat by the Kaduna State chapter of the All Progressives Congress to expel him from the party. The party had on Thursday condemned Mr. Sani and accused him of anti-party conduct for critising the new pricing and supply framework for petrol introduced by the federal government last week. It also threatened to punish the activist-politician by sending him away from the APC fold. But in a response Friday morning though his Special Adviser on Politics and Ideology, Suleiman Ahmed, the senator described the party’s threat as the hallucination of a barely educated ogogoro (local gin) drinker. He accused the state APC of being an appendage of the Kaduna government which he said had been fighting him. “It will be interesting for the general public to know that even the so-called state headquarters of the APC is a building owned by a top PDP chieftain in the state,” he said. Mr. Sani’s statement in full:. “The press conference and threat of expulsion made by one Tanko Wusono of Kaduna APC against comrade Senator Shehu Sani for objecting to the increase in pump price of petroleum products stands unambiguously condemned. Kaduna APC as it exists today is simply an extension of El-Rufai’s government. “The press conference is the hands of Jacob and the voice of Esau. The said Tanko Wusono is the special assistant to El-Rufai’s Commissioner for local government Bashir Saidu at the same time member of Kaduna internal revenue board. El-Rufai is cowardly to directly confront Sen Sani and resort to using Buhari’s name to fight his domestic battles. “Senator Shehu Sani reserves the right to freely express his opinion and no bespectacled pigmy can stop him from doing that. El-Rufai was never and is still never a Buhari man but a pretender who can kneel down to anyone as long as that can propel him to power. “The use of APC Kaduna to fight Shehu Sani by El-Rufai is a testimony to how timid and mischievous the governor is. El-Rufai is a man who had abused PMB and only aligned himself with him when Yar’adua and GEJ denied him juicy ministerial positions and recognition he craved. “El-Rufai is a man who had spent 13 years of the 16 years of PDP in power and now claims false progressive credentials. The heart, the lungs and the “blockos” of El-Rufai are still PDP. He is an arrogant man allergic to criticism. It’s shameful that the El-Rufai, who claims to be a Buharist, still can’t publicly declare his assets like PMB. “El-Rufai has simply destroyed APC in Kaduna state. In all states in the north people are decamping from PDP to APC except in Kaduna. “El-Rufai is a bad and rotten egg in the APC. He knelt down for Atiku to become BPE chair and later betrayed him. He knelt down for Obj to become a minister and later betrayed him. He knelt down for Buhari to be governor of which later he will betray him. Fear El-Rufai whenever he kneels down before you. 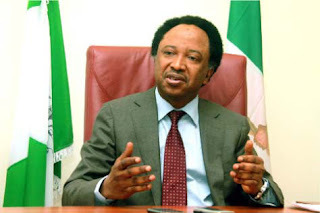 “Senator Shehu Sani is one hundred percent a supporter of PMB but he is neither a sycophant nor a hypocrite who will not speak his mind when there is the need to do so.